Information: In the lobby, a greeter will give you a bulletin. It will have an outline of the service and announcements. Some services have the service outline and songs shown on the monitors in the front of the worship area, so the bulletin may only have announcements. Where to sit: Please sit wherever you are comfortable! During the service: You can follow along using the bulletin or, if available, the monitors at the front of the church. 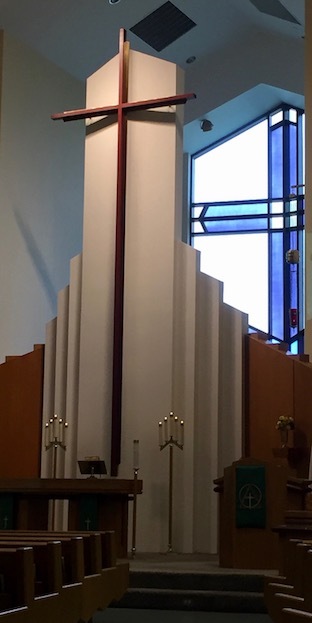 In the racks in the pews you will find a Lutheran Service Book and bibles – you may need to use one or both during the service for songs or readings. After the service: As people leave, they are greeted by the pastor. Please stay and visit with others in the lobby area – on Sundays coffee and cookies are available! What to wear: Please dress as you please -- you will find a range from casual to dressy here. What about kids? Children are always welcome in worship at Immanuel. If you feel you need to leave the service with a child, you can go into the lobby area and still hear and see the service. If needed, we also have a nursey room with toys located toward the rear of the church building near the restrooms. Baby changing stations are located in both restrooms. Can I take communion? At Immanuel, we celebrate Holy Communion on the 1st, 3rd, and 5th Sundays (and preceding Saturdays). Those who come forward for communion are expected to hold the same confession as this congregation and the Lutheran Church Missouri Synod. Children who come forward with their parents and have not yet celebrated their First Communion will receive a blessing from the pastor.